Sandra Jollet went to Japan for the first time ten years ago. Fascinated by the traditional culture she discovered there, she dreamed of creating a ryokan atmosphere of in the middle of the Marais. 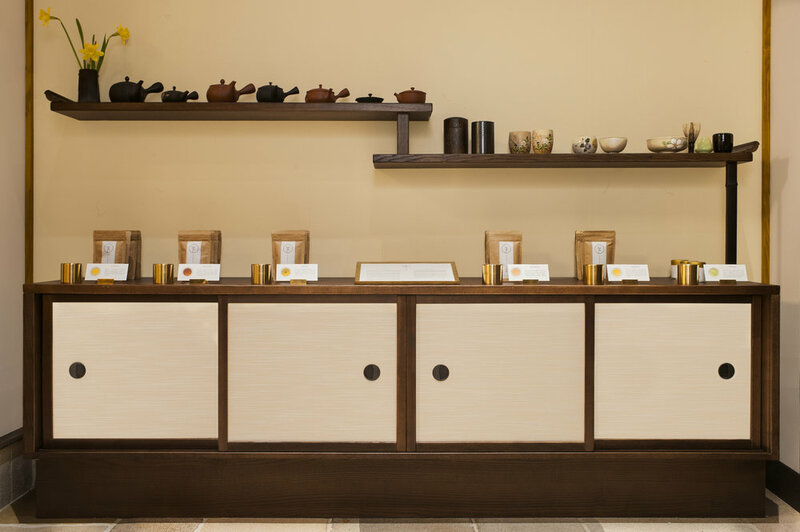 Last year, she opened Suisen - a Japanese word that translates as both "daffodil" and "take care of yourself" - with a massage parlor, organic teas and a wellness space combining bespoke-care and spirituality. Following our one-hour Shiatsu session - a massage style reknowned for physical and emotional benefits - we had the opportunity to ask Sandra a few questions about one of her other passions: the healing and therapeutic properties of tea. INSIDE/OUT: What was your idea behind this carefully chosen ‘collection’ of teas? SANDRA JOLLET: I wanted to make these teas readily available, to convey the pleasure they provide - very important - and to help people learn about their benefits. For example, green tea is an antioxidant packed with vitamin C. It is beneficial for the immune system, many considered it to be a real medicine. Teas also serve as an invitation to calm down, to take a moment away from the busy outside world. IO: How do you select them? SJ: I started by doing tastings with a few different producers until I settled upon six teas with the level of quality I was targeting. Here at Suisen, you can choose the tea you want and enjoy it after each massage session or make a selection to take home with you. They are all organic (only 7% of tea production in Japan comes from organic farming) and grown at a Japanese producer located in Kakegawa, near Mount Fuji. This privileged geographical situation, associated with a traditional earth work and a fast parboiling technique makes it possible to obtain a tea with a very strong taste. And since I do not have an intermediary, I have access to better products than the ones we have in Paris. Kukicha is made from leaves and twigs. It’s the healthiest of all Suisen’s teas, very low in caffeine. It is said to yangize the body (the yang is associated with male strength and creation) and drive out fatigue. It’s an excellent choice if you are lacking in minerals and the benefits can be felt immediately. A pleasant tea to enjoy when waking up. Preparation: For a teapot of 240 ml, infuse 2 teaspoons of tea with 80 degree water for 30 seconds. Gyokuro is a tasting tea made of young sprouts. It is an amino acid with relaxing properties and rich in caffeine. This exceptional tea is infused with warm water to preserve all its qualities and develop its taste. Preparation: For a 150 ml teapot, infuse 3 teaspoons of tea with 60 degree water for 2 minutes. A green tea, very rich in vitamin C. After 3 cups a day, we generally start to feel the benefits of the flavonoids, antioxidants as well as its cleansing power. Sencha is recommended for flushing fat and sugar from the body. It’s also compatible with our slimming massage treatments. The taste is slightly astringent due to the richness of the tannins and its iodized notes. Preparation: For a 210 ml teapot, infuse 2 teaspoons tea with 70 degree water for 1 and a half minutes. Houjicha is a grilled, amber and woody green tea. It is a go to for people who have heartburn or who don’t do well with stimulants. It is comforting, round and soothing. An ideal tea for the end of the day. And very easy to prepare! Preparation: for three cups infuse 4 teaspoons of tea in 95 degree water for 30 seconds. Genmaicha has the taste of popcorn and roasted rice. It’s easy to drink and goes well with food or following a meal. Our western clientele particularly likes it. Preparation: For a 400 ml teapot, infuse 4 teaspoons of tea with 85 to 95 degree water for 30 to 40 seconds. Traditionally used for the tea ceremonies, matcha is an energizing tea made of green tea leaves that is whisked until frothy, then served with something sweet to complement its tonic and earthy flavor. With matcha, we drink the whole leaves so the whole body benefits to the max. Best to drink it early in the day. Preparation: Put the powder in a bowl (chawan) and whisk the tea with a bamboo chasen until frothy.